The word ‘sacrifice’ has had problematic meanings over the course of my life. This coming ANZAC day has me pondering its meaning again. The thoughts are all bound up with memories of the smell of my dad’s suit as I ran to him, when he got off the bus on the way home from work, and he swooped me up into his arms. I snuggled into his shoulder and cuddled into the musty odour of tobacco pipe, and I can still see the view of the patch of greenish coloured suit coat with an RSL badge on the lapel, that was the border of security and intimacy re-established at the end of the day. This year my brothers are going to walk in the ANZAC march wearing Dad’s medals. Mum had to search them out. Dad was not one for medals after the first few years. He just tossed them in a drawer and left them there. They carried more weight for him than any of us ever realized. As a woman born one month after the end of World War 2, I grew up in a world in which sacrifice was the currency of the conversation, but was misunderstood by a generation born and raised here that did not experience war, or see its devastation, directly. Our family lived in a whole new suburb of ‘War Service Homes’, where the reality of war was never shared by the men returning home. It is only now that we know that we lived in a suburb of families whose fathers were suffering in one way or another from the effects of deep trauma, and who themselves were caught up in that unexpressed suffering. We were the generation who decried war, and the iconic play of our time was ‘The One Day Of The Year’, which explored that gap in perception and the division it caused in families. We did not even begin to comprehend the layers of what we did not know; there was no room for conversation across that pain and the feelings of rejection and misunderstanding our brashness must have caused. (We also lived with the ‘New Australian’ refugees from Europe, and understood even less what pain and loss they carried with them. That is another whole post altogether). We meant well. We did understand that war is no solution to problems that are caused by so many hidden factors and power struggles, that the participants – the ‘foot sloggers’ so to speak – are the ones who make the sacrifice, but are also unknowingly the sacrificed. We didn’t know that they realized this too, and even so were willing to commit themselves. The word ‘sacrifice’ is so deep in the national psyche, that it has attracted layers of cultural meaning that have been used again and again to appeal to the heroic impulses of young men and now to young women as well. We should not find it hard to understand the attraction of disenfranchised young people to that word. We use precisely the same dynamic to ensure a ready supply of ‘cannon fodder’ for our own purposes. Nonetheless, under all the complexities of history, geography, power and politics, true sacrifice is real, and the courage to make it is undeniable and must have its due respect and gratitude. Only from the viewpoint from the seventieth hill, am I able to understand it deeply. Towards the end of Dad’s life, I video-taped a series of programs that centred on the last men who saved Australia from the northern invasion. The threat was was real, not imagined or constructed for manipulative purposes. Our Dad was there, sitting in the extremely vulnerable rear gunner’s turret, saving our way of life and many of our lives, as I just floated in the warm cocoon of Mum’s womb. As I worked on the medals, Mum and I shared a few stories that Dad had told us right at the end of his life. Mum spoke about her regret in not knowing them before that, and how much difference it would have made if she had. The one that has stayed with her most strongly is the one that he said was the worst moment of his life. He was out there on his own in the turret flying over the Owen Stanley Range (where today adventuring Australians challenge themselves on the Kokoda Track). A Japanese plane drew so close that Dad and the gunner in it could see each other’s faces. There was a moment of recognition when they each truly communicated what they saw: that they were two young men doing what they had been told was the best for their country, and they were now having to try and kill each other. Dad thanked me for the effort of taping those programs but said he didn’t want them. The brother who always lived interstate feels deeply his inability to have had the long conversations at the end of Dad’s life that he wished for. For him, marching in the centenary parade is a way of connecting with Dad again. His twin brother is walking with him and I wonder what it means to them as men. I wonder what they will know after walking in their father’s footsteps for a short time. 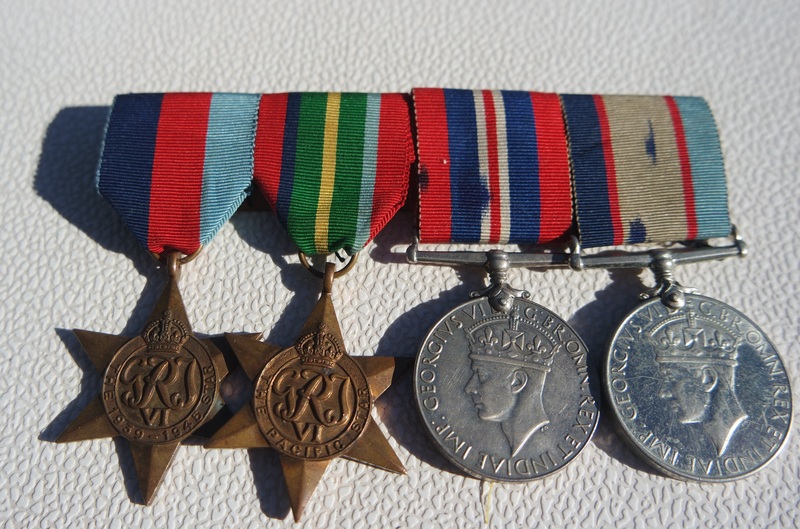 Mum is not able to see fine detail enough to restore the medals herself, so with the help of our friendly neighbour, I found myself holding the bronze stars and silver discs and folding the ribbons that were such a small visual reminder of so much history. I felt privileged to be able to do it. Our neighbour, who turned out to be the same generous Legatee who helped Mum with the layout and a spare ribbon and bar, said that she should definitely not clean the medals. They are meant to be worn carrying their story as witness. I have to confess that they are just a little bit cleaner now though. In the sewing, there were tears.